There is so much I just love in this outfit! Let's start with these boots. They are amazing knock-offs of the Stuart Weitzman 50/50 boots. The suede is gorgeous, they are truly OTK boots even on a tall girl like me, and the best part they are about 1/7th of the price!! They are on sale here at Nordstrom, Macys, and Zappos! Get em while you can! This Loft skirt I liked so much I bought in 2 colors. This hunter green and also winter white. It was on sale for 60% off the sale price so I couldn't say no. Something about the sweet little flare shape doesn't make it seem so short and inappropriate for teaching, as long as it's worn with tights and boots or flats. This was also the first time I tested out my AMAZING new GHD oval curling wand! It gives you these great denty waves that look like intentional bed-head! That't the best way I can think of describing it. 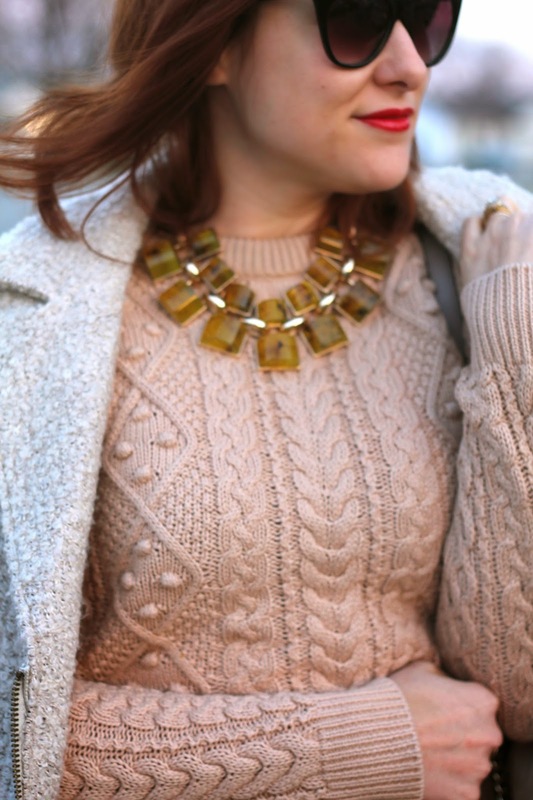 This statement necklace was a recent find at H&M! For under $20 it packs quite a punch, don't you think? Easily adds so much to a simple sweater like my tan cable knit one. I also broke out the Mac classic, Ruby Woo, for my holiday look. It's such a great true shade of red and I think it looks great on so many different skin tones. Hope you are all getting a chance to scoop up some great after Christmas sales. Don't forget to hit up my favorite sale going on at Zara right now! Orange You Glad It's Picture Day?